John Robbins, heir to the Baskin-Robbins ice cream company – a role he chose not to take on in order to live his life in accordance with his values – is the author of the Food Revolution: How Your Diet Can Help Save Your Life and Our World. Robbins is best known for his book, Diet for a New America, which focused on factory farming and the inhumane treatment of animals that are raised for food. In The Food Revolution he brings our attention to these issues once again while also highlighting the impact of genetically modified foods and how our current methods of food production are affecting the environment and our health. Robbins advocates a whole food, high-fiber, plant-based diet – essentially a vegan diet – not only for its health benefits but also because it is best for the environment and is compassionate towards animals. He outlines detailed research on the benefit of a vegetarian diet for reducing the risk of diseases such as cancer and heart disease. The Food Revolution also describes the conditions inside factory farms and the suffering that animals endure that often results in these animals developing cancer, respiratory illness, pain, immobility and abnormal growth. These are the animals that are eaten as food and this obviously has negative implications for our own health. The topic of genetic engineering is discussed in depth and Robbins warns us that we cannot predict the potential effect that the dramatic reliance on genetically modified organisms may have on our health and the environment. He also includes a critique of high-protein diets and provides readers with up-to-date information on subjects including food-borne illness, world hunger, nutrition misinformation and global warming. Fruit, vegetables, oatmeal, pasta, rice, bread, legumes, nuts, seeds, avocado, coconut, rice milk. This book is focused on the impact of our food choices and does not include an exercise program. 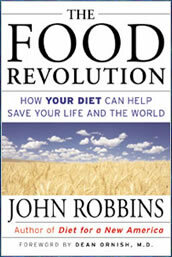 The Food Revolution: How Your Diet Can Help Save Your Life and Our World retails at $17.95. Increases awareness about the food we eat. Vegetarian diets are associated with many health benefits. Dispels many myths about the health implications of modern diets. Well researched and based on scientific information. Will appeal to those who want to learn more about vegan diets. Not specifically designed as a weight loss or health prevention program. Does not include food recommendations or a sample meal plan. Vegan diets can be low in certain nutrients if not planned carefully. Some readers may not relate to the author’s writing style. A vegetarian lifestyle does not appeal to everyone. The Food Revolution highlights the negative effects of modern farming methods on our health and the environment and inspires the reader to take action by adopting a vegetarian lifestyle. This book will give you information that will help you to support the environment, reduce suffering on the planet and live a long and healthy life. While The Food Revolution goes into detail about the problems we are currently facing it also provides hope by highlighting the organic food movement and consumer activism and the positive impact that can occur when individuals make educated and compassionate choices.